It's time for another review of yet another BBQ book I have read in an effort to improve my 'Q'ology. Yes, I made that word up, but you really can't argue with it or the definition: 'Q'ology: noun 1. The study of taking of a variety of meats, applying spices and the smoke from a low and slow fire, mixed with some time with those you really like hanging around in order to turn out some really good supper. 2. A word made up by Jeff Stone. 'Q'ology. 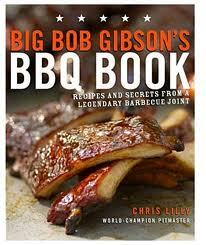 This book does 'Q'ology with a reflection on the roots of Big Bob Gibson himself. Anyone living in or around Decatur, AL has probably heard of Big Bob Gibson's BBQ and their white sauce. While Big Bob didn't write this book himself, Chris Lilly has taken time from his competition-winning, restaurant-running days to pen a book that is a bit of a hybrid. Make no mistake, Chris shares some good recipes of all kinds, but he also tells a story of a man who took a chance and made good on it. Big Bob Gibson started doing 'Q' waaaaaay back in the day and he learned to do it right. Chris started out right out of college and had the opportunity to learn from the man himself, and the rest, as they say, is history. The book shares a lot of pictorial history about a man who set out to feed his family and wound up doing pretty well with it. One quote from the book that I found particularly poignant was from Big Bob himself, "You don't need a laundry list telling you what to do. Just sit on the stump and listen. The chickens will whisper to you when they need to be flipped. The pork will sing when it is finished smoking. The fire will wink at you when another log is needed. No list, no clock, no thermometer can tell you how to cook good barbecue. You sit in the corner and you just know." Now, for those who know me and my obsessive nature and attention to detail and order (my teammates refer to me as Adolph at competitions) will know that this goes against all there is in me. A sort of flying by the seat of my pants if you will. With that said, what Big Bob said makes tons of sense. This book tries to highlight the fact barbecuing is not wholly a science as much as it is a combination of science, art, black magic, skills, experience, and plain old blind luck with a hint of love tossed in for good measure. Chris does a good job of doing the basics. He breaks down the different spices, how to 'build' a good rub, how to make a good sauce, even that white sauce. He discusses the effect of different types of woods, what to look for when making good barbecue, and he talks about what to do to get the best 'Q'. If you are looking for a BBQ book that jumps out of the gate with "Do X at time Y for Z duration", this may not be the book for you. If you are, however, looking for a BBQ book that pays homage to the man himself while imparting some good cooking technique and delicious looking recipes, this just may be the book for you. Chris honors Big Bob by sharing Big Bob's experiences and history. What you will get is a history lesson, a cooking lesson, several recipes and enough wins in professional competitions to back up what he presents. I've seen Chris on some of the BBQ shows, and he does pretty dadgum well for himself. He is from Alabama, so he has that going for him right out of the gate. His style was given to him by Big Bob; however, not all of the recipes are original to Big Bob. The recipes Chris shares in this book look and sound great. Brunswick Stew, Big Mama's chow chow, Spicy Cuban Black Beans and Rice, Caramel Pecan Mini-Pies, Carolina Mustard Sauce, Passion Fruit Butter Sauce, and many other mouth-watering recipes. As for the white sauce...I'll take the Beatles White Album, 'Bama's white away jersey, fresh white snow, Snow White and the Seven Dwarves, Ms. Lilly White, don't do right, everything's gonna be alright, turn on the white light, and even a little don't shoot until you see the white's of their eyes, but I'm not so sure about a barbecue sauce made with mayonnaise. I guess a road trip to Decatur, AL might be in order. Maybe Chris will let me sit on the stump. I'm guessing no. To Brine or Not to Brine....That is the Question. Where does "BBQ" come from? Ever wonder where BBQ sauce origninated?